Akshay Kumar's last attempt at an entertaining movie with a socially relevant message didn't completely resonate with me. You can read the review of 'Toilet: Ek Prem Katha' here. However, his latest film, 'Pad Man', is miles ahead and entertains, educates, and informs in an engaging and moving way. Akshay Kumar is at his best in 'Pad Man', a socially relevant and entertaining movie. 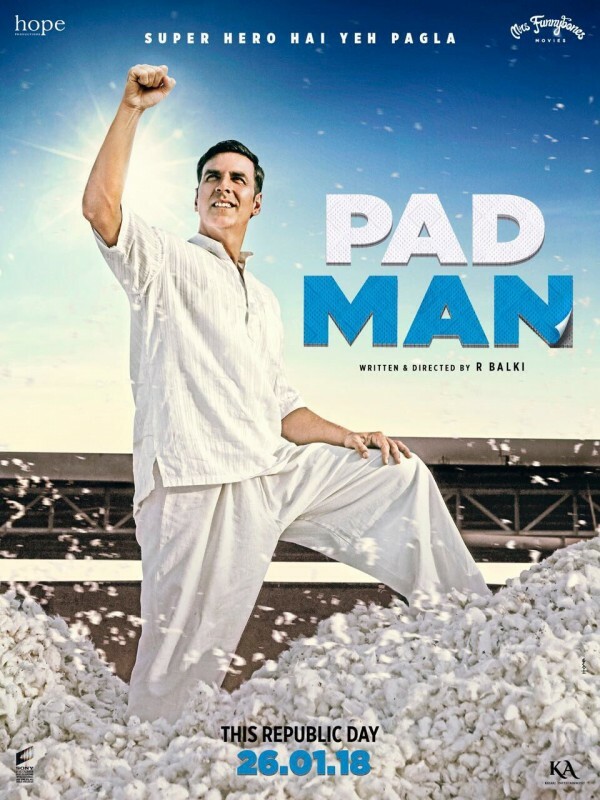 'Pad Man' is a biographical movie based on a book written by Twinkle Khanna (Akshay Kumar's wife) which was in turn based on the real life story of Arunachalam Muruganantham, the inventor who brought affordable sanitary pads to India. The film is a wonderful movie about how one man's desire to protect his wife, sees him inadvertently clashing with an archaic mindset and social attitude that results in him losing everything. The movie is set in 2001 In India, when there was a perspective that a woman getting her period meant that she was unclean and impure, and therefore was separated from the rest of her family for the duration of the cycle. This meant that the woman slept outside, on the terrace, and wasn't allowed inside the house during this time. This was the norm. Newly married Lakshmi (Akshay Kumar) loves his wife, and can't bear to see her treated like a Leper. So he purchases imported sanitary pads from the local pharmacy, after a humorous exchange with the shop owner, and borrowing some money from a friend. When his wife, Gayatri (Radhika Apte) realizes how expensive they are, she refuses to use them. After a chance meeting with a doctor, Lakshmi is clued in to the dangers of using anything other than sterile pads during a woman's period. The doctor educated Lakshmi on the dangers and ill effects on a woman's health and life, that improper hygiene during the menstrual cycle can cause. Empowered, Lakshmi makes his own version of a pad for his wife to use, bypassing the issue of high expense. The story of 'Pad Man' is simply this: one man trying to save his wife from the health issues that may be caused by adhering to a lifestyle that is more based on cultural tradition, than any informed knowledge. However, the man ends up facing a lot more than a simple hygiene change issue, as his family leaves him, he is ostracized by society and left with nothing. 'Pad Man' is a compelling story about changing social attitudes on a massive scale, and how much more difficult it is to do the right thing, when you're going up against decades of tradition and religious and cultural misinformation or ignorance. Kumar plays Lakshmi with such heart, that one almost forgets that this is the same actor of movies like 'Housefull' or 'Singh Is Bling'. The veteran actor shows his incredible range portraying a character that is not as exaggerated as a super cop or a righteous hero with all the answers. 'Pad Man' is a rare Akshay Kumar performance these days, that sees the actor lose himself in the role, and endear himself to audiences. Lakshmi is innocent, naive, and idealistic, and most of that is conveyed through Kumar's expressions and body language, more so than anything else in the film. The credit of Kumar's performance has to be, in part, shared with writers R. Balki and Swanand Kirkire. The writing is excellent in 'Pad Man', because the character does go through an arc, and conflict within himself that sees him learn, grow and change through the duration of the movie; instead of a know-it-all character who is reacting to the conflicts around him, and prevailing. The progression of the story is so heartbreaking that the climax is fully earned and justified, despite easily coming off as cliche'd. While 'Pad Man's protagonist is glorified, both in the film and this Review, the story never once demonizes any one character either. While it's gut wrenching when Gayatri decides to leave Lakshmi for his insistence on making women's sanitary pads, going to lengths that bring public embarrassment and shame to the family and herself, it never feels like she's being unreasonable or is a terrible person. Gayatri's character is a great representation of characters that may serve to be antagonistic in nature within a given story, but aren't necessarily villains. Gayatri's actions and thoughts are a result of her cultural mindset and being a person living in the world around her. A lot of it is also from a lack of comprehending her husband's viewpoint, which is a great statement on the blinding power of a collective mentality. Gayatri cannot understand why her husband insists on creating something to make her safe, even though that instinct is born out of Lakshmi's love for her. Apte is brilliant in a role that can easily be considered a supporting role with little impact. But her performance and unique portrayal cause audiences sympathize as much with a wife trying to stand by her man, despite never understanding his motives, as the husband who loses her. R. Balki is careful not to preach. While 'Pad Man' throws around statistics about women not using sanitary pads in India, and the undesired results, the movie is careful not to jam this message down our throats. It's subtle and shown more from the point of view of the protagonist, than any overt moral that is being passed down. And this is also where Sonam Kapoor's business student Pari comes into the story. Pari is shown as a modern day girl, who essentially provides the access for Lakshmi to take his innovative way of thinking from the small rural village, to new heights. The story does dip slightly when Kapoor is on-screen. There is a lot of unnecessary character building moments, and cute-sy sequences with Pari, that seem out of place with the rest of the story. It almost feels as if Kapoor was given carte blanche to play Pari as herself. However, her contribution to the story is important, as Lakshmi's larger, social activism elements are as a direct result of knowing her. It's a great way to ensure that Lakshmi's character isn't betrayed by him having complex socio economic ideas that would be out of nature for the character that's been set up thus far in the story. 'Pad Man' is a highly enjoyable and endearing film about a concept that may still be taboo in India today. (and even outside of India, for that matter) However, writer and director R. Balki is able to package this story in an engaging, entertaining and emotionally compelling way that is not preachy, and therefore is even more effective.